U.S. stock indexes mixed Friday: With few headlines, focus was on House passing three-month debt ceiling, government funding extension. Dow +0.1%, S&P 500 Index -0.2% (-0.6% on the week), Nasdaq -0.6%. Friday’s trading saw above-average volume, modestly negative breadth. Financial sector led on the day, but underperformed for the week as yields fell; energy did the opposite as WTI crude oil prices tumbled Friday, but gained ~1% on the week. Treasuries gave back some of Thursday’s strong gains, pushing 10-year yield +2 basis points (0.02%) to 2.06%, near 2017 lows. Oil fell 3.3% as refiners continued to recover from Hurricane Harvey and Irma headed toward Florida coast. U.S. dollar weakness continued; hit lowest levels since 2014, stemming primarily from subdued inflation stoking doubts over Federal Reserve’s (Fed) outlook on rates. Commodities – COMEX Gold little changed near $1351/oz., +0.7% on the week; industrial metals lower over both periods. Global stocks up; sentiment boost on (likely temporary) easing of geopolitical tensions; less-than-feared, but still significant, impact of Hurricane Irma. Asia markets up on reprieve from risk aversion in the absence of expected North Korea missile test over the weekend. Nikkei +1.4%, Hang Seng +1.0, Shanghai Composite +0.3%. Europe following Asia, extending gains midday. Insurance shares leading on hopes of less hurricane-related damage than originally feared. STOXX Europe 600 +0.9%. Treasuries weaker across the curve; 10-year yield +5 basis points (0.05%) to 2.10%. U.S. dollar rallying as positioning related to potential Fed considerations of hurricane impact on gross domestic product is unwinding. Strong dollar weighing on gold (-0.8%). Oil showing resilience. Buoyed by reports of another extension of Saudi-led production freeze; WTI crude +0.4% to ~$48/bbl. Tax deal could be pushed out further. Last week’s short-term agreement between President Trump and Democratic leadership to push out the debt ceiling debate and extend government funding for three months sets up another budget battle to watch in December. This latest development means that for the next three months, policymakers will be hammering out a more difficult, longer-term budget deal, rather than holding the most meaningful tax discussions. The bottom line is that a tax deal could potentially be pushed out beyond Q1 of 2018, although we continue to place better-than-even odds of something getting done ahead of the mid-term elections that provides a meaningful boost to corporate profits when implemented. Busy week of economic data ahead. Small business optimism, labor market turnover, inflation, industrial production, and retail sales for the important back-to-school shopping season highlight this week’s domestic economic data calendar. The Fed is in its quiet period ahead of the central bank’s September 19-20 policy meeting. Overseas, a plethora of Chinese data is due out, including inflation, retail sales, industrial production, money supply, and new loan growth. 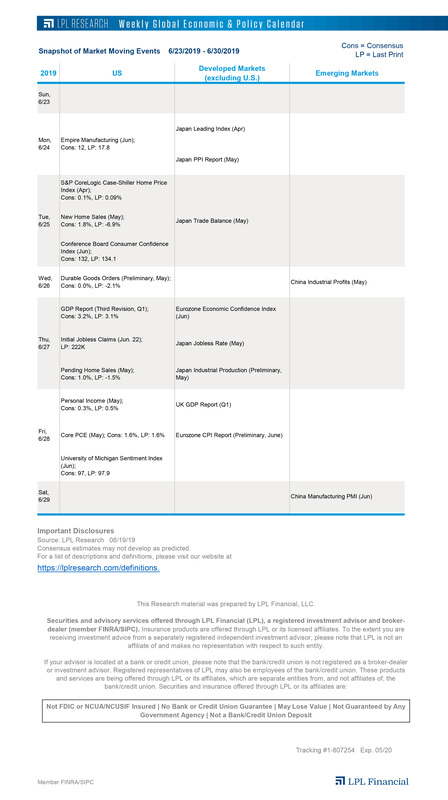 Elsewhere, Japanese manufacturing and Eurozone and U.K. inflation data are due out this week. What should have been a relatively simple procedural vote on Brexit has become a danger point for Theresa May’s government and the prospect for an orderly Brexit. Either Monday or Tuesday, the U.K. Parliament is scheduled to vote on a bill that effectively copies and pastes European Union law into the U.K. legal system. Doing so would give a common starting place for any changes needed to effectuate the Brexit decision. Failing to get this passed may result in legislative chaos. Though passage is expected, given May’s relatively weak coalition government, it is not guaranteed. Furthermore, there is a chance that amendments will be added that could cause uncertainty on Brexit in the future. Beige Book Barometer provides key insights ahead of this month’s Fed meeting. The Fed’s Beige Book, released two weeks prior to each Fed policy meeting, is a qualitative assessment of the nation’s economy in each of the Federal Reserve’s 12 regional districts. LPL Research assesses the overall sentiment in the Beige Book through its Beige Book Barometer, which measures the difference between positive words and negative words in each Beige Book. In this week’s Weekly Economic Commentary, due out later this afternoon, we review our Beige Book Barometer for September to determine whether there were any changes in sentiment around several key aspects of the economy. European Central Bank is providing an extra boost to sentiment on reports over the weekend that it is considering changing the rules of its bond buying program that would result in more bonds being purchased from countries like Italy and maybe even Spain, providing additional stimulus to those markets. The euro fell below the 1.2 level this morning, but it remains in a solid uptrend. Strong European corporate earnings recently have buoyed regional markets, but pitfalls remain. Even with recent outperformance, European stock prices have not increased fully with earnings, resulting in more attractive valuations for European equities relative to domestic stocks. In our Weekly Market Commentary, we examine how the relative valuations between these regions have changed, making Europe increasingly attractive. However, we also highlight how much of the recent outperformance of European markets (for U.S. investors) has been due to currency, not underlying price, movements. While this suggests European stocks may have more room run, we also point out some potential problems stemming from a stronger euro. Debt ceiling worries caused the short-end of the yield curve to invert briefly last week. The U.S. 10-year Treasury reached its year-to-date low yield of 2.04% on Thursday, September 7, 2017, as rising tensions with North Korea, the potential for hurricane damage, and the debt ceiling combined early last week and led to a bond rebound. Since then, with some of these events abating, the yield curve has normalized. This afternoon, we explore what this could mean for the bond market going forward on the LPL Research blog. 52 weeks in a row without a big weekly decline. The S&P 500 has now gone 52 straight weeks without closing lower by at least 2%. This is the longest such streak since 61 weeks in a row that ended in late 1995. The longest ever was 90 consecutive weeks ending in December 1958. There’s good news surrounding this statistic, which we explained in a recent LPL Research blog post.